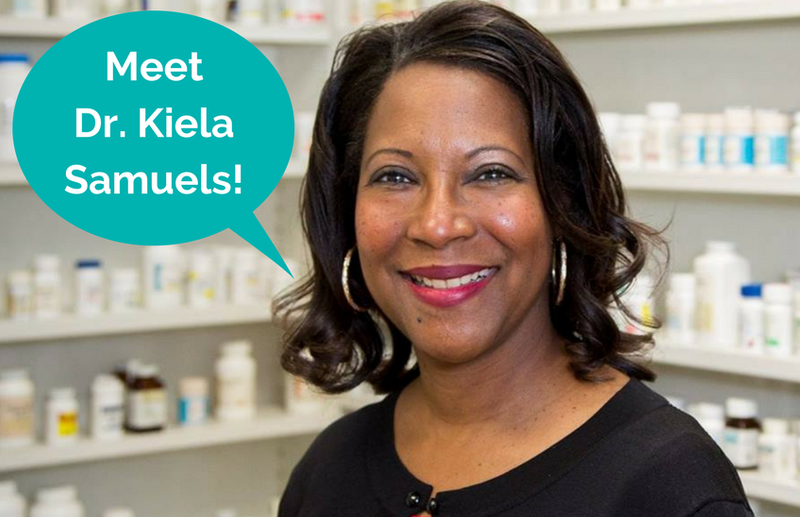 Meet your pharmacist, Dr. Kiela Samuels! In high school, Dr. Samuels had a wonderful mentor who told her that she needed to get a PharmD—and it was the best advice ever! 30 years later, she is a Clinical Pharmacist in the Allergy & Immunotherapy Division at the University of Michigan and is the Faculty and Pharmacy Technology Program Director at Washtenaw Community College. My mother was a nurse, and of course, I needed to do something different. When I looked for job opportunities, I always found openings in healthcare. So I decided to look into pharmacy and getting a PharmD. While in high school, my mother contacted the Director of Pharmacy at the hospital where she worked and he hired me to be a “messenger,” or what we now call a “pharmacy runner,” for the weekends. It was then that I decided this would be my career. What makes your career path in pharmacy unique? Currently, I am the group lead for work/life balance at Michigan Medicine Allergy Division. It’s our Chief Physician’s desired to achieve joy and fulfillment. So, what do I do? Work hard, play hard! It’s so important to know what “season” you are in your life. I have two grown sons and a husband. It’s important to spend time with family. I sing with the jazz band at the community college and at my church. I decided to plant a garden this year. Planting was fun, weeding and harvesting…not so much. However, I do enjoy the eating! I also vacation as soon as there is a break in the academic year: holiday, winter break, and summer (I don’t teach spring or summer semesters). Flexibility! I do a lot, but I have a great team of people who work with me. I certainly have responsibilities. However, I have flexibility to pick and choose the projects I pursue. I wake up every day excited about going to work! As my life has changed, pharmacy was right there to change with me. Now I am on the later part of my career. It gives me great pleasure to see others succeed. When my students are doing great things, it’s such a sense of accomplishment to help with the development of that pharmacist or pharmacy technician. What do you wish someone told you in high school as it pertains to pharmacy? I had the best mentor in high school. The Director of Pharmacy I mentioned told me that I needed to get a PharmD—and it was the best advice ever! Although, I did not realize how difficult it would be. Some of my student who have gone on to medical school will tell you pharmacy is just as challenging. What advice would you give to students wanting to go to pharmacy school? Get your doctorate degree in Pharmacy (PharmD)! I tell students, do a residency and get board certified to your area of choice. Go beyond what is expected. We do a poor job of letting the public know what we do. People think that pharmacists only work at their community pharmacy or at the hospitals. It’s up to us to educate the public on our unique skill set. It’s getting better. Many physician practices in my area are employing pharmacists to see patients with difficult pharmacotherapy issues, therefore patients are seeing even more clinical aspects of our jobs.